The Innogen Institute has celebrated its 16th anniversary with a conference at The Open University on 28 February, entitled Looking Backward and Forward. Innogen is a collaboration between the University of Edinburgh and The Open University whose research supports the delivery of innovation that is profitable, safe and societally useful. The event, now available to watch on the OU's Stadium platform, was both an evaluation of the impact Innogen has had on academia, real-world policy, and the OU; and a pointer as to where it is uniquely placed to make a contribution to an uncertain and challenging post-Brexit future. It opened with contributions from key figures in Innogen’s development, who highlighted the Institute’s defining themes of co-production – re-imagining relationships between innovation, regulation and publics – and radical interdisciplinarity. Professor Joyce Tait explained how Innogen was conceived in 2002 as an ESRC centre which would examine life science technologies outside the constraints of traditional disciplinary and theoretical barriers. She also explained the Innogen framework from different perspectives, including those of industries and companies. A key area of Innogen research soon emerged in Genetically Modified Organisms (GMOs), the kind of regulation they needed, and how it should facilitate, rather than stifle, innovation. Professor Tait emphasised the importance of proportionate and adaptive governance of innovative technologies in order to deal with issues of risk and at the same time enable acceleration. She outlined how her work for Innogen in the areas of standards has influenced policies around the development of government frameworks and regulations. Professor David Wield drew attention to key strengths of Innogen, including innovation paths and dynamics of life sciences, regulation and global research. He explained how Innogen promoted academic careers, capabilities and research networks which are still in place. As a next step, he proposed the integration of global and grand challenges by developing research for the Global Challenges Research Fund, Grand Challenge, Research England and Research Scotland, and Innovate UK/Innovation Caucus. He argued that Innogen is well equipped to do this, and should be seeking for ways to address questions of international productivity, disruption, value networks and internationalisation. Professor Jo Chataway emphasised how Innogen has opened up new areas of work unbiased by disciplinary perspectives, and has become a platform for innovation in methodology for social research in technologies. A key Innogen message, which has now entered the mainstream, is: ‘Don’t let theory hold you back’. Its research starts with problem-framing and uses theory to help explain, rather than to define approach. Another message is: ‘Don’t worry about being instrumental’ – research designed to inform decisions, and informed by the needs of non-academics, can still be excellent research. The final speaker Professor Andrew Webster, a former member of the ESRC evaluating panel for Innogen, highlighted Innogen’s success in influencing policy and debate within science and technology. Innogen has been responsible for more than 800 academic publications and has been crucial in making the case for innovation systems to be more inclusive of people’s needs and to bring on board excluded publics. He also emphasised the part it has played in advancing the careers of young social scientists, offering an impressive set of statistics on the number of professors and senior lectures who have emerged from Innogen. 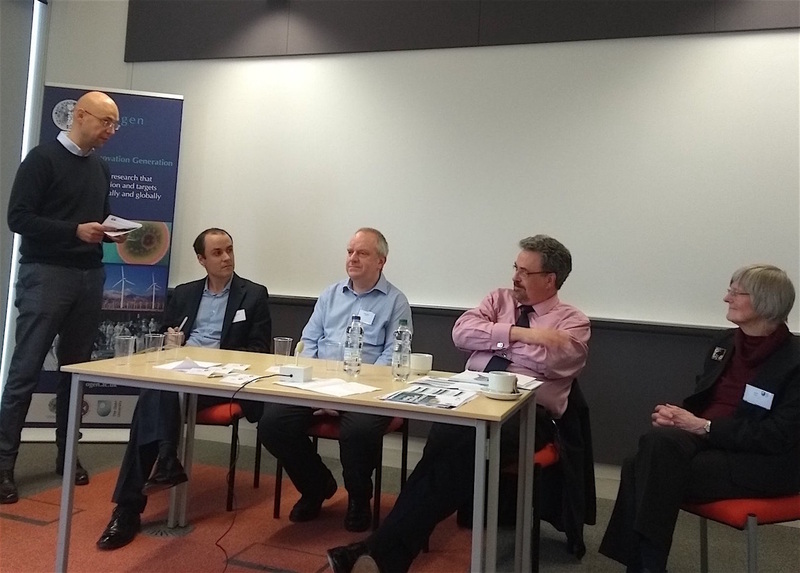 The Panel discussion with questions from the facilitator Dr Alessandro Rosiello and the floor focused on whether the post-Brexit industrial strategy outlined in the Government’s White paper is fit for purpose, and how it can be made to work. Key points emerging from the discussion were: the importance of collaboration between key industries and key research universities; the need for a central framework to support regional and local collaborations in industrial development; and the need for Government to boost the flow of venture capital. There was also agreement that the current uncertainty over Brexit is hugely damaging, and innovative companies need to be encouraged to stay and grow in the UK rather than moving abroad. The important role of standards in driving the development of certain technologies was raised, and the need for wider involvement in the developing of standards – in particular, the involvement of small and medium-sized enterprises as well as large multinational concerns. Director of Innogen Theo Papaioannou hailed a ‘brilliant’ and ‘very successful’ event and said it was particularly timely in the year that the OU celebrates its 50th anniversary. “The Innogen directorship has moved to The Open University in this anniversary year, so it makes sense to look now at Innogen’s contribution to academia and to the OU. You can watch the event in full on the Stadium platform, Session 1 for speakers and Session 2 for Panel discussion. Innogen has also marked its anniversary with a revamped website, which has a new section on regulatory challenges.